As many SCD followers know tuna can become an important part of the diet. It adds some convenience for travel and lunches. That being said not all tuna is SCD friendly. The brands you grew up with like Bumble Bee and Chicken of the Sea have broth containing soy in most of their products. More importantly there is broth containing soy in the handy little tuna packs and tuna cups that are so good for travel. However, there are SCD friendly alternatives. What an SCD follower needs to look out for is tuna that contains only fish, water, and sea salt (or only fish and water if you don’t want salt). There are quite a few brands out there that fit the bill, but it can be a little overwhelming when looking at the shelves. Gone are the days when you could just grab a few cans of whatever is cheapest. Yes, you will have to pay a little more, but you shouldn’t have to break the bank to get a can of tuna. I have seen jars (yes glass jars) of tuna for $11.99 and though I am curious to see what it tastes like, I just can’t bring myself to spend that kind of money on canned fish. I rarely spend that much on fresh fish! I did once splurge and buy a can of Tuna Guys albacore tuna because I read how it good it was. I found it for $5.49, down from the usual $8.99 so I decided to try it out. It was good, but I didn’t find it to be any better than some of the other premium brands I have bought for much cheaper. The most economical brands are probably Whole Foods 365 store brand and Trader Joe’s store brand. They are usually under $2.00 a can for the regular tuna. I personally like regular tuna better than the more expensive albacore. Bumble Bee does make a premium tuna that does not have broth, but I think it uses regular salt. I have used it in a pinch when it was the only non-broth tuna I could find. 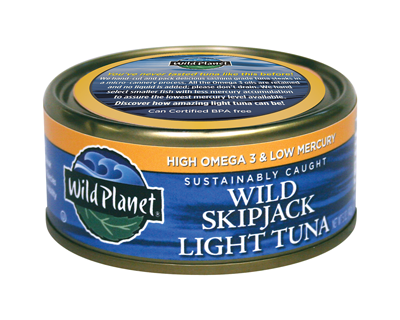 My personal favorite tuna is Wild Planet Wild Skipjack Light Tuna. I think it has the best flavor and I can usually find it at a good price – around $2.50 a can. I recently found some on sale for $1.89 a can. The cans have a pull off top so they are nice to take with you without worrying about a can opener. For travel, pouches are the most convenient. For my business trip I bought Polar tuna packs for $1.00 a pouch. They contained no broth or soy. They were the perfect size for a single serving and they worked really well for the trip. I packed them in my suitcase since I didn’t think the pouches would pass the liquid test for carry on bags on an airplane. I guess if you want to fly somewhere with your tuna you should be prepared to check a bag. This is the only pouch tuna I have used so far, though I may try a different one for comparison should the need arise. As with everything else SCD it is important to read the label. I didn’t think the tuna I had been eating had soy in it until by chance I looked at the label one day. Check out this one too! This is the SCD legal brand I use. Only use the Selects, however.